This scene appears so commonplace, there seems nothing to notice: a student waiting for a rapid transit car, connecting to the Internet with her tablet. You might miss an oddly shaped antenna on the roof. The scene is a station on West Virginia University's elevated "personal rapid transit" or PRT system, where on a recent December afternoon, 21-year-old Gail Jennings is waiting for the next car. The senior accounting major pulls a Dell Venue Pro 8 running Windows 8 from her shoulder bag, and surfs to a WVU website, SimpleGifts, for a streaming video of the annual holiday concert. Her web connection, and the streaming video, are fast and smooth, via a Wi-Fi connection to an access point in the transit station. But it's what the access point is attached to that makes this scene uncommon: a "white spaces" radio that is part of a campus pilot network turning unused TV frequencies into a broadband cornucopia of new spectrum for fixed and mobile users. Like the efficient 30-year-old PRT system, WVU's 7-month-old white spaces network links three main campus locations, ranging from a mile to a mile and a half from each other over the hills and dales of Morgantown. "Broadband in this state is a huge challenge," says John Campbell, WVU's chief information officer. "We're very rural and very mountainous. Between the terrain and the weather, it's hard on infrastructure." Campbell was approached two years ago by Air.U, a consortium of education associations, public interest groups and tech companies, including Microsoft and Google, working to bring white spaces networks off the drawing board into production. "We immediately jumped at the chance, not just for around the campus, but around the state," Campbell says. "White space" refers to two types of spectrum traditionally set aside for TV broadcasting: the unused spectrum deliberately left between different TV channels, acting as a buffer between them; and unused spectrum that was either left over or vacated as TV stations shifted from analog to digital TV. In 2008, the FCC leveraged both types, ruling that unlicensed, unused VHF and UHF TV channels could be used for other applications, with certain restrictions and requirements. In the U.S., these TV bands are 6-megahertz channels mainly in the 470-698 MHz UHF band. Because of the lower frequencies, these signals propagate very well meaning they can penetrate walls, roofs and other obstacles. They also can reach much longer distances than Wi-Fi, and they can, in effect, "flow" over hills and valleys. At WVU, for example, the radio distances range at full power up to five miles. WVU is using FCC-certified white space radios from Adaptrum, a San Jose startup that has developed a software-defined radio that can dynamically shift channels, channel sizes, and power levels. The company says its radios are highly efficient. "We use 90% to 95% of each 6 MHz TV channel, about 2 bits/hertz, which is about the maximum, for 12 to 14 megabits per second per TV Channel," says Darrin Mylet, Adaptrum's head of business operations and regulatory affairs. "We can use 12 high-powered channels in West Virginia. Twelve [channels] times 14 [MBps] bring you into the hundreds of megabits per each small cell." "Twelve channels of 6 megahertz yields 72 megahertz, which is comparable to a 4G provider's network," says Robert Nichols, CEO of Declaration Networks, a white spaces network integrator based in Alexandria, Va., and the man who launched the Air.U project. The result is a bonanza of new spectrum, especially in rural areas. Even metro areas with lots of TV broadcasting where stations will reap additional spectrum. The IEEE 802.22 Working Group, has already published standards for Wireless Regional Area Networks (WRAN), aimed at this unused spectrum worldwide, seeing it as a key to bringing broadband to vast areas, and populations that have little, if any, connectivity today. WVU is one of the latest global pilots for white space networks. Based on the experience there, such networks could quickly blossom and expand, largely by allowing conventional Wi-Fi links to, in effect, piggyback on white space connections. Air.U launched a "quick start" program aimed at higher education, offering a range of services to let institutions quickly roll out a white spaces network. The heart of WVU's white spaces network is the Adaptrum base station radio, on the rooftop of the Engineering Sciences Building near the center of Morgantown. With it, are the accompanying directional antennas, cabling, power supply, performance and availability monitoring equipment, switching facility, and interconnections for back-haul through WVU's backbone to the Internet. There are five Adaptrum client radios, one for each PRT station, along with their own antennas, an Ethernet connection with one or more off-the-shelf Cisco Wi-Fi access points. Because of the proximity of other TV signals, all white spaces radios in the U.S. link with one or another FCC-certified "white spaces database," of which there are several including one from Google. The radio has to "call home" daily to the continuously updated database, report its location, and receive the current list of protected channels those occupied by TV stations or wireless microphones and available channels. The FCC certifies radios to work with specific databases. Earlier this month, Carlson Wireless Technologies of Sunnyvale announced its RuralConnect white space radio system had won FCC certification for use with the database maintained by Spectrum Bridge. Campbell says the actual deployment of all the gear was "pretty straightforward." "The biggest challenge was getting the internal approvals to install it on the roof," he recalls. "And we had to get power to the roof along with a network connection." The initial network went live last summer, with students gaining access in August as they returned for the new academic year. The entire network is transparent to end users: they simply use Wi-Fi to create a connection for laptops, smartphones, tablets and the like. The Adaptrum client radio makes the necessary conversions on its end, and sends the packets over the TV band to the basestation, which then does its own conversion magic, and connects with a router into the WVU network and through there to the Internet. 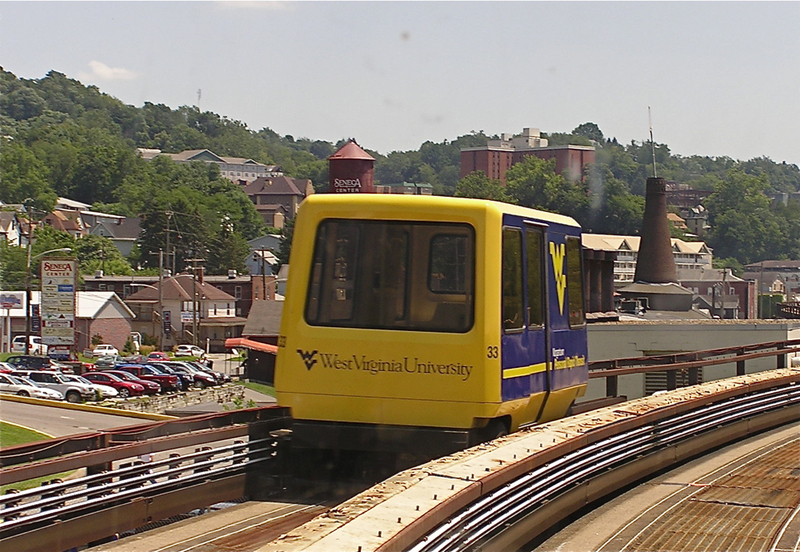 The next step, says WVU CIO Campbell, is phasing in similar packages Adaptrum radios, Cisco access points, cabling and power -- on the 70-odd PRT cars, which are stubby four-wheel vehicles, sporting WVU's blue and yellow school colors, and running along a raised channel, with room for about 10 to 12 passengers. Users will be able to take a seat for the ride's duration and stay connected the whole way. The university is also talking with Morgantown city officials about white space use for police and fire departments, and other city agencies eventually. "White spaces will be more reliable than cellular signals," Campbell says. "And it travels better in the nooks and crannies of the valleys of West Virginia."